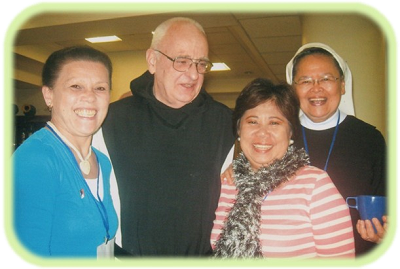 The “Third World Congress of Oblates of St. Benedict” had 156 delegates of every tongue, color and nation. They represented 50 different countries and met from October 4-10, 2013 at the Salesianum, a place run by the Don Bosco Fathers. At the opening, the National Coordinator of Oblates in Italy, Romania Urbanetti, warmly welcomed the Delegates to her country. This was followed by the official opening of the Congress by Abbot Primate Notker Wolf, OSB who has been the moving spirit behind this Congress and past congresses. True listening will lead to conversion, and this conversion of heart will enable us to listen to and hear the voices of the people of God: the poor; migrants and refugees; women; indigenous people; the aged and physically challenged; the ostracized; the “groaning of mother earth”, etc. How to respond to these various challenges of our times? Engage in prophetic action for ecological education and conscientization, solidarity with the IPs in their struggle for their rights to land, belief, culture; work for the empowerment of women; avoid forms of discrimination, etc. In conclusion to her rousing talk, Sr. Mary John came up with this meaning of our Benedictine ORA ET LABORA: “Mystics are prophets in contemplation and prophets are mystics in action.” In Fr. Michael Casey’s talk “The Word Became Text and Dwelt Among Us,” he explained how, “in a certain sense the word became text and dwelt among us. For by the power of the Holy Spirit a potent remembrance of the Word we created which could be handed on from generation to generation- first orally and then in writing. Further, Fr. Casey pointed out how the faith-filled reading of God’s Word is the foundation and support of our whole spiritual life. The practice of Lectio Divina is a signature activity emanating from the Rule of Benedict. Lectio is the heart and soul of Benedictine spirituality, though not exclusively so. There is a quasi-sacramental aspect to Lectio Divina- it is a salvific encounter with the Word, in which God is the principal agent. When we enter the sacred space of Lectio Divina, the Word becomes flesh again, our Emmanuel, dwelling with us in our space and time, speaking to us, energizing us. A challenge in our technological age: become prophetic by reversing the most serious problem of our time, the “globalization of superficiality.” Compare the hours spent each week with radio, TV, internet, and social networking with the hours spent weekly in lectio divina. Which of these sources of formation has the greater influence on our thoughts and conduct? Lecito divina does not merely inform; it seeks to reform so as to conform to Christ. For their part, the Oblates worked on four topics in groups 1) the Rule of Benedict with focus on silence and the Benedictine principle of ora et labora; 2) the Oblates’ relationship with the Monastery; 3) Living our Oblation- modelled on Christ’s self-giving and making one’s oblation fruitful in family life, at work, in the parish, in the socio political-inter-religious spheres; 4) “Obsculta” (listening)- silence as a prerequisite for listening- we need to listen to others, to life, to the word of God. Fr. Pambo Martin’s thoughts on listening further enriched the topic of the congress. 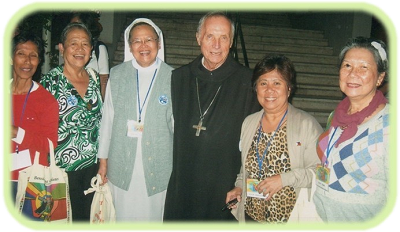 He spoke of the need to Listen in order to fruitfully fulfill one’s mission as an Oblate. He challenged the delegates to infuse our social, economic, political and entire human life with Gospel/ spiritual values. Using imagery, he described listening as the key to obedience; mutual understanding; mutual respect and tolerance, “Obsculta!” We need to listen in silence to God’s will, to the Word of God, to the world around us and respond to the sufferings and cries of people. This listening which opens a door to the practice of all other virtues, should lead to the Oblates’ prophetic/concrete action in the world they live in. 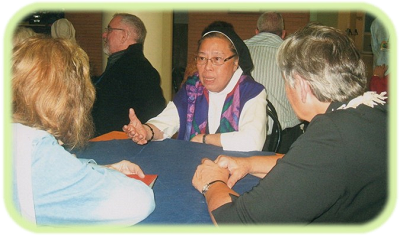 The congress came to a happy conclusion with the Coordinators of the different countries meeting with the Abbot Primate regarding the planning of the next World Congress of Oblates.